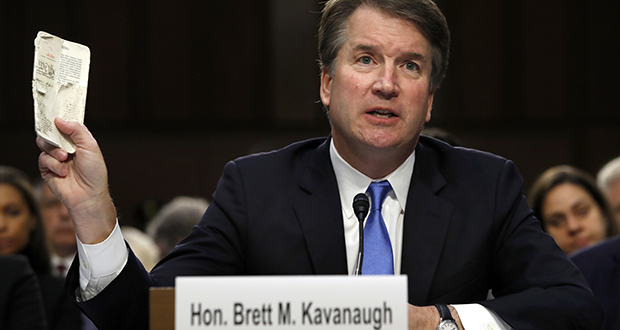 The confirmation hearings for Judge Brett Kavanaugh, which began Tuesday morning, mark the culmination of a process that goes back at least 35 years, to the founding of the Federalist Society. Its purpose was to create a conservative majority on the U.S. Supreme Court. Spurred by their disagreement with the abortion-rights decision Roe v. Wade, legal conservatives made judicial selection into the touchstone of their agenda, and gradually convinced the rest of the conservative movement to do the same. When Kavanaugh is confirmed — and I do mean when — their success will be complete, and the court will likely have a stable conservative majority until 70-year-old Clarence Thomas retires. The upshot of this long view of the Kavanaugh confirmation is that nothing can stop it. The resistance put up by Democratic senators at the start of the hearing won’t matter. There will be no liberal miracle, no deus ex machina suddenly appearing to block it from happening. No Republican senator today can afford to go against a tide of conservative activism that has lasted a full generation. No revelation about President Donald Trump, no matter how bad, can derail Kavanaugh. That’s because Kavanaugh’s nomination is not so much Trump’s act as it is the very visible hand of the Federalist Society acting through him on behalf of conservatives everywhere. Kavanaugh, after all, was a George W. Bush protégé with no Trump administration ties at all. Given his political resume and background, it is safe to say that he only escaped becoming a “Never Trump” voice because he was on the bench and not able to express political opinions publicly. No matter how many times Democrats say that Trump lacks the legitimacy to name a Supreme Court justice, no Republican will be swayed by this argument. To the contrary, for many conservatives, the nomination of Kavanaugh, alongside the confirmation of Justice Neil Gorsuch, is the only thing that gives Trump any legitimacy at all. Even conservatives who take the view that Trump is a disaster for the Republican Party (and isn’t much of a conservative himself) nevertheless can forgive almost anything in exchange for Gorsuch and Kavanaugh. The way this happened is genuinely fascinating. The origins of the conservative focus on judicial selection go back to the liberal Supreme Court of the 1950s, ’60s, and early ’70s. That court didn’t become liberal through carefully vetted partisan appointments. Justice William Brennan, who with Justice Thurgood Marshall led the liberal wing for decades, was appointed by Republican President Dwight Eisenhower. So was Chief Justice Earl Warren. Roe v. Wade, the last landmark liberal decision of the era, was written by Justice Harry Blackmun, who was nominated by Republican President Richard Nixon. After the Roe decision, however, legal conservatives decided that enough was enough. They had not exercised sufficient influence over Nixon to avoid the appointment of Blackmun, whose chief distinction was a childhood friendship with then-Chief Justice Warren Burger. The answer was the Federalist Society, a group that has skillfully, brilliantly and patiently educated and nurtured legal conservatives from law school through their careers. Few civil society groups in U.S. history have been as effective. There’s nothing nefarious here. The Federalists are remarkably open and transparent. To become an insider, one simply needs to be genuinely smart and genuinely conservative. Over dozens or even hundreds of repeated interactions, mostly organized around intellectual exchange, members get to know one another well. The informal hierarchy that results informs judicial appointments, as it was always intended to do. Kavanaugh has long been understood to sit at the top of that informal Federalist hierarchy. Clerking for him was the most coveted job a young conservative could get right out of law school. Nearly all of Kavanaugh’s law clerks went on to clerk for the Supreme Court. That’s extraordinarily rare. Among current judges, only Merrick Garland (nominated by President Barack Obama to the Supreme Court but never voted on by the Senate) has a comparable rate of success. The point is simply that the network, from law students all the way to Supreme Court justices, understood Kavanaugh’s place and saw him as a likely future justice. Above all, legal conservatives got the Republican Party to listen to them. Case in point: Trump’s outsourcing of his judicial selections to the Federalists. This success must be contrasted with the relative failure of legal liberals, who talk a lot about the importance of judicial selection but have never exercised substantial control, much less influence, on Democratic judicial appointments. No doubt Kavanaugh’s confirmation hearings will feature plenty of speculation about where on the conservative spectrum the nominee falls. (Hint: right of Chief Justice John Roberts, left of Justice Samuel Alito.) That’s instructive and interesting. But make no mistake: The outcome of this confirmation process is foregone. It was over a long time ago; maybe as early as 1982, when Kavanaugh was only 17. How so? Are you saying Obama’s nominees were/are not qualified liberals? I’m not arguing the point….I would like examples and maybe clarification of the point being made.